Fronds Music by Jason Sharp Text by Kaie Kellough Fronds is a collaborative work for multiple instruments and voices. It is an acoustic and electronic sound processor with large-format, projected typographic design. Borrowing from ecopoetics and text collage, this work expresses deep concern for the state of our planet and the precariousness of our existence. featuring: Kaie Kellough - Voice Tanya Evanson - Voice Jason Sharp - Bass Saxophone & Electronics Joe Grass - Pedal Steel Guitar Stefan Schneider - Drum Kit Kevin Yuen Lo Kit - Visual Design Kaie Kellough and Jason sharp have collaborated since 2011. 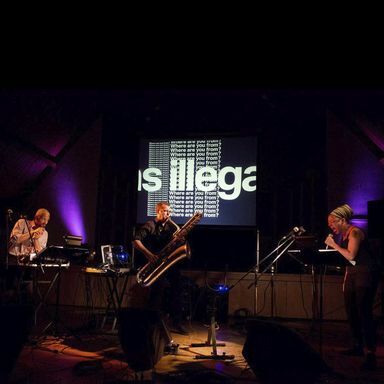 They have performed internationally in experimental music, literary, and jazz milieus. Their work embraces a maximalist sprawl across forms, engaging disparate ideas and reconciling contradictions. Kellough-Sharp incorporate visual projections with oft-unreadable text, electronic with acoustic sound, improvisation with composition, and performative immediacy with noisome abstraction.